With the need to meet the requirements of two meal plans, it can be an extra challenge to find breakfast recipes for a vegan diabetic. Your mother was right. Breakfast is the most important meal of the day, and this is especially true for diabetics. A meal combining protein and low-glycemic carbs helps regulate blood sugar levels, preventing high spikes and sharp dips that can cause problems such as difficulty concentrating and fatigue. Good carb choices include whole-wheat toast or steel-cut oats, or low-glycemic fruits like berries or melon. Combine your carb with a low-fat protein like vegan yogurt, tofu, or a vegan-friendly meat substitute for a healthy and balanced breakfast. Is a Vegan Diet Safe for Diabetics? Quite simply, yes. The same basic diet guidelines apply to all diabetics, whether vegan or non-vegan. Consume carbohydrates in moderation, and choose whole grains and low-glycemic fruits instead of heavily processed flours and sugars. Keep close track of your meals to be sure to get an adequate amount of protein, about a half gram of protein per pound of body weight each day. Few plant proteins contain all eight needed amino acids, so vegans will need to be careful to get protein from a variety of sources. Some days, there's no time to put together a meal. If you need a quick meal for a morning on the run, a smoothie might be just the ticket. Combine all ingredients in a blender, and blend until smooth and creamy. If a meal-in-a-glass isn't your morning preference, try using tofu as a base for a vegan version of classic scrambled eggs. The small amount of turmeric won't add a strong flavor, just a pleasant color, and the arrowroot will make the consistency more like real eggs. Heat a non-stick skillet over medium heat. Add the crumbled tofu, salsa and spices to pan and cook, stirring, for about 5 minutes or until hot. Variations: Just like real eggs, tofu lends itself to almost endless variations. Add leftover vegetables or whole grains. Adding two teaspoons of nutritional yeast with give the tofu a cheesy flavor. The only limits are your imagination and personal preferences. For less hectic mornings or weekends, there are also breakfast recipes for a vegan diabetic that can make the meal fit for a special occasion. Combine all ingredients in a medium sized saucepan and bring to a simmer. Cook uncovered about 20 minutes or until thickened, stirring occasionally. May be served hot or cold. Spread the cornflakes on a plate. Combine the tofu, soy milk, nutmeg and cinnamon in a small bowl, and stir or whisk until smooth. Dip the bread in the mixture until coated, then place each side of the bread in the crumbled cornflakes, pressing slightly so the cornflakes stick. Spray a pan with vegetable oil spray, and fry bread until each side is golden. Serve with sliced fruit or sugar-free syrup. 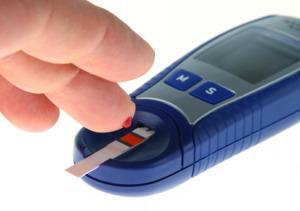 If you are diabetic, please talk to your doctor or a certified nutritonist with any questions about your eating plan.